The β-lactams are a vast family of antibiotics that include the well-known penicillins; they remain the most widely administered antibiotics around the globe. Results from this research could reveal new strategies for coping with the expanding scope of β-lactam resistance now happening among Gram-negative pathogens. Disease-causing Gram-negative bacteria have gained public notice as potential “superbugs,” causing serious, even fatal infections in hospitals and clinics. Examples of such bacteria include Acinetobacter baumannii (A. baumannii) and Pseudomonas aeruginosa (P. aeruginosa). Gram-negative bacteria resist β-lactams mainly by deploying protein enzymes called “β-lactamases.” These β-lactamases bind to and cleave open β-lactams, thereby inactivating them. “Roughly speaking, the β-lactamases are nano-scale molecular scissors the bacteria use to cut open the crucial β-lactam ring of these antibiotics, making them useless,” Peng said. There are a great variety of β-lactamases that target different β-lactams. Peng and his group have been investigating the Class-D β-lactamases found in A. baumannii, one of the Gram-negative pathogens that has earned “superbug” status. In response to drug pressure, A. baumannii Class-D β-lactamases are picking up point mutations that are expanding the spectrum of β-lactams they can destroy. This has led to A. baumannii strains resistant to multiple β-lactams, including the carbapenems, which are considered drugs of last resort. There is a genuine concern that these trends could render A. baumannii resistant to all β-lactams. This concern has motivated numerous studies to understand how these mutations work at the atomic level. The main approach has been determining 3-d atomic structures of mutant β-lactamases, typically using x-ray diffraction of crystallized proteins. The tacit assumption – that the mutation effects are structural in origin – is a cornerstone of modern biochemistry and biology. 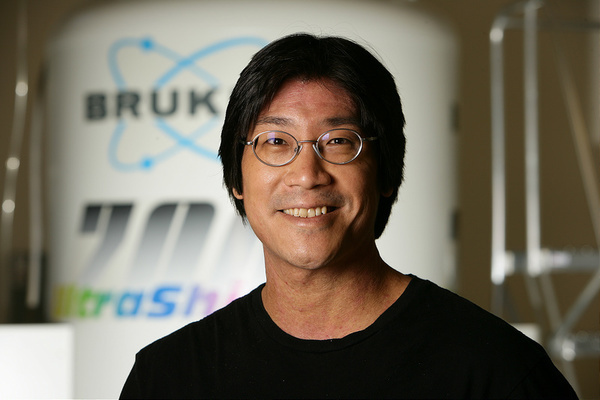 By contrast, Peng’s research will focus on an equally important, yet less-examined molecular property of proteins: their internal dynamics, or flexibility. And for good reason. Peng’s group, in collaboration with Prof David Leonard of Grand Valley State University, recently investigated a β-lactamase variant from a clinical strain of A. baumannii carrying a single point mutation responsible for expanded activity. Notably, the mutation was not in the buried active site pocket (where the captured antibiotic is cut open); instead it was in an adjacent flexible surface loop, at the vestibule of the active site. Using high-field multidimensional NMR spectroscopy, Peng and his group showed that the mutation changed the protein dynamics – in particular, the amplitude and time scales of motion for the surface loops. The mutation also had unexpected long-range or “allosteric” effects, perturbing the motions of other surface loops known to be important for recognizing the antibiotic. Peng continued with the scissors analogy. “It’s as if the mutation made the scissors more effective, not by changing its structure, but instead by changing the breadth and rapidity by which it opens up.“ Their findings have potentially broad implications as to how resistance-enhancing mutations work, since many other β-lactamases have similar placement of flexible gating loops guarding their active sites. Originally published by Cheryl Schairer at biophysics.nd.edu on August 28, 2018.